I have to say that forming an opinion of this film was no easy task. It is neither a good movie nor a bad one. Perhaps I have been spoiled by most other child or young adult movies containing one- liners and innuendos. I kept waiting and they never showed. What also makes this difficult is the cast of voices are of German decent and here lies their filmography in unfamiliar territory. Such is not the case with Director Ben Stassen who was producer of Thunder and the House (2013) and Director Vincent Kesteloot, A Turtles Tale 2 (2012). However, that being said the animated details of the highs seas and Crusoe’s ship is impressive. The characters interaction with one another is seamless when a daring parrot (Kaya Lanar) recounts how Robinson Crusoe came to be stranded on a tropical island. Matthias Schweighöfer who is considered one of the most promising young German actors uses his voice to give Robinson Crusoe life. Crusoe is more like Pink Panthers Inspector Clouseau, very clumsy and basically inept; until he enlists the help of this parrot named Mak who is later given the name Tuesday by Crusoe. But I digress; this tiny tropical island inhabited by Mak and his quirky animal friends find their paradise interrupted following a violent storm and wake up to find a strange creature on the beach - Robinson Crusoe. Slowly and often reluctantly but eventually surely, they all start living together in harmony, until one day, when their comfortable life is overturned by two savage cats whose hunger has them on a hunt. 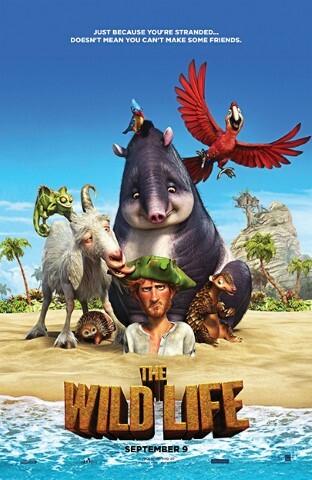 When a battle ensues between the cats and the group of friends, Crusoe and the animals soon discover the true power of friendship against all odds. There are moments of humor, but often they fell flat; perhaps because they were also predictable. The cats I found to be more annoying than entertaining. One positive thing, and I looked for anything, was their facial expressions. The only other positive thing was the last twenty minutes in which everything comes to a head with chase scenes and mass destruction.